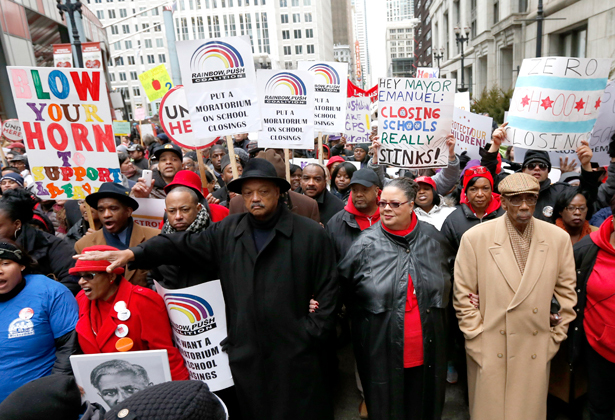 A resurgent protest culture fights back against Rahm Emanuel’s austerity agenda. On a sunny saturday this past May, far down on the city’s black South Side where corner stores house their cashiers behind bulletproof plexiglass, about 150 activists assembled at Jesse Owens Community Academy. In just a few days, Mayor Rahm Emanuel’s appointed Board of Education would vote on the largest simultaneous school closing in recent history. Owens, along with fifty-three other public schools, was on the chopping block. A recent Chicago Tribune/WGN poll found that more than 60 percent of Chicago citizens opposed the closings, and a healthy cross section of them had turned out for the first of three straight days of marches in protest. They know the words because they’ve been here before. The CTU beat Rahm in a historic strike this past September and hasn’t stopped fighting austerity and privatization since. They probably know the words across town too, where a simultaneous march along an even longer route on the even poorer black West Side was going on. But it isn’t just CTU members who know the words. The progressive tribes have been gathering in Chicago with force, efficiency, creativity, trust and solidarity, building a bona fide, citywide protest culture. And it’s working. Days before these marches, Mayor Emanuel, who has been talked up in some circles as possibly the first Jewish president, told the Chicago Sun-Times, “I am not running for higher office—ever.” This purring protest infrastructure is one of the major reasons why. To many national observers, this rebirth of the city’s militant protest culture seemingly came out of nowhere. But it didn’t. It’s the product of years of organizing from sources both expected and surprising. And while the radicalized CTU under the leadership of Karen Lewis has deservedly received much of the credit, the teachers union is just the current tip of the spear in a long and potentially transformative movement. “I think we have a synergy going on here that is unrivaled in any other city,” says the Rev. C.J. Hawking, “but it could be replicated.” Hawking is originally from the far South Side neighborhood of Mount Greenwood, “where all the firefighters and cops live.” Twenty-nine years ago, she became a United Methodist pastor. Twenty years ago, during a historic strike in the downstate town of Decatur, she began devoting her ministry to labor issues. In 2007, she became executive director of Arise Chicago, a group founded in 1991 by local religious leaders who wanted to mass their voices together in favor of workers and immigrant rights. Arise created a thriving workers center in 2002, and in the fall of 2011, the group was at the center of the Week of Action, one of the most extraordinary protests in any US city in recent memory. It began on a Monday in October. The Mortgage Bankers Association was in town for its annual meeting. From five separate sites across downtown, the marches began; late in the afternoon, they converged on the Art Institute of Chicago. There, on the rooftop pavilion of a sumptuous, brand-new wing designed by Renzo Piano, the wizards responsible for wrecking the US economy sipped champagne and networked. Or at least they tried to above the din of the peasants singing, chanting and yelling up at them from below. On any other day, the pavilion’s vertical struts look like graceful architectural ornaments, but on this day, they looked like jail bars. Martin Luther King said a long time ago, “There is nothing more powerful to dramatize a social evil than the tramp, tramp of marching feet.” He is right—still. I saw fear written on the bankers’ faces. On our faces, I saw joy. The next day at the Pritzker family’s Hyatt Regency Hotel, sixteen activists from Southsiders Organized for Unity and Liberation were arrested for occupying the sky bridge between the hotel’s two wings, as hundreds in the streets below cheered them on. A group called Action Now dumped garbage from a vacant foreclosed home outside a Bank of America branch. The rest of the week was filled with similar actions. It was a triumph. It turned out to be easier to work together than anyone thought. After testing out a smaller feeder march in June, the groups met in October for an intensive week of planning using an innovative organizing model: they separated into a dozen or so groups of twenty-five. Each group contained members from different organizations; those members planned their own actions, argued together, socialized together and then, when the pivotal moment came, stuck together on the streets. Stand Up! Chicago dubbed the groups “flying squads” after the Flint, Michigan, General Motors sit-down strikes of 1936–37. “Each flying squad was completely bonded to each other by the end of that week,” says Hawking. At a debriefing after one protest, an experienced activist testified that he rarely felt so free to voice an opinion, to disagree and still feel that he was heard. I ask Hawking whether she thinks the Week of Action had a direct effect in inspiring the success of the Chicago Teachers Union the following year. “Absolutely. Absolutely,” she answers, before listing a tumult of actions that followed, one feeding into the next: a takeover of the LaSalle Street Bridge over the Chicago River on November 17; 4,000 teachers in their red CTU shirts filling the Auditorium Theatre for a rally that grew into a 10,000-person march in May 2012; the September CTU school strike itself and, three months after that, a meeting of a Workers Organizing Committee of Chicago at the St. James Cathedral, dedicated to fighting for a $15 hourly wage; Black Friday at Walmart; the spread of the fast-food strikes to Chicago; and the latest marches against Rahm’s school closings. Occupy Chicago has also played a fascinating role in the city’s burgeoning protest movement. Listen to wiry, intense and voluble Jerry Boyle, the movement’s pre-eminent legal defender. Boyle is another product of a “classic South Side Irish family”—this one, though, made up of stalwarts of the Irish Republican Army. “I’m a green diaper baby,” he says, which explains something of his fascination and passion for street politics, a subject on which he has emerged here as something of a theorist. The Occupiers also moved one mild October evening to Grant Park, the city’s front yard. Many were arrested for violating the city curfew, some violently—one reason the White House announced, in March, that the G-8 was taking its conference elsewhere. Meanwhile, lawyers working with Occupy contested their arrests before a judge named Thomas Donnelly. Late in September of 2012, Emanuel was served another humiliation—his second in weeks after losing the school strike—when Judge Donnelly dismissed the charges by ruling that the application of the curfew law violated the First Amendment because it was applied differently for different political events, such as President-elect Obama’s legendary victory party in Grant Park in 2008. There’s another group that has changed the face of protest in Chicago, and they’ve done it indoors, sans picket signs or fake blood: the data nerds. Tom Tresser is a former Shakespearean actor who moved to the city in 1980 and soon found himself making his way into arts administration, which sparked an interest in policy. “You start asking questions. You start to look at zoning laws, city planning,” Tresser says. When Republicans started going after the National Endowment for the Arts in 1989, Tresser began attending the Midwest Academy, a legendary training ground for Chicago organizers. In 2007, he noticed a neighborhood outrage: the Latin School of Chicago, one of the city’s toniest private high schools, was carving out a corner of Lincoln Park as its own private soccer fiefdom; the public would be permitted access only 10 percent of the time, during winter. On a shoestring, he and some neighbors filed a lawsuit. On their day in court, they were shocked to find that among the twelve lawyers lined up on the other side, one was a partner in Chicago’s most high-powered white-shoe law firm and another was the city’s chief corporation counsel. Tresser quickly realized that “something bigger than a soccer field was at stake” in his Lincoln Park suit. At the time, Chicago had been named a finalist for the 2016 Olympics. “If we got a legal ruling that you can’t privatize a park, the Olympic bid would have been dead before it was unsealed,” he recalls. For privatizing parks on behalf of corporations were what the Games would be all about, and “we would have got nothing for it except bankruptcy.” Tresser and his neighbors weren’t going to stand for it. “I believe what we call ‘the public’ is under attack in America today: public housing, public education, public health, public transportation. All these things have become precious and scarce, and have actually become dirty words,” he tells seventy-five activists one April evening at a meeting of his next venture, the TIF Illumination Project. TIF, or tax increment financing, was a potentially noble solution to fix a market failure. Developers don’t want to build in blighted areas where banks won’t lend money, thereby guaranteeing their continued blight. TIF districts are supposed to subsidize development in these underdeveloped areas essentially by borrowing against projected gains in tax revenue generated by the new construction. But in Chicago, the idea has metastasized in a particularly wicked way. TIFs became a scam to funnel public funds to wealthy private interests; the allegedly “blighted” areas came to encompass the Lyric Opera, which got TIF money to spruce up its bronze door handles, and the Chicago Mercantile Exchange, which was pledged $15 million, in part to refurbish its bathrooms. In response to the latter scandal, activists from the anti-TIF movement marched on the Chicago Mercantile Exchange bearing a golden toilet, embarrassing the company into publicly rejecting the money. Tresser’s work is to create more stories like that one. But to get TIF money returned, you have to find it first—a frightfully difficult task. Each TIF district goes through a review panel composed of representatives from various city agencies, all of them appointed by the mayor. There is supposed to be one public representative on each panel, but that person is appointed by the local alderman and usually doesn’t have much of a clue about what’s happening. A TIF developer seeking public favor can promise to hire a certain number of locals, but there is no mechanism for evaluating whether the developer holds to the deal, and no penalty if it doesn’t. TIF projects are discussed at Chicago Development Commission meetings, but by that time they are basically done deals. No one knows the backroom process by which TIF-worthy projects are determined, though there does seem to be one constant: “If the mayor wants a project,” Tresser notes, “the project will happen.” What’s more, TIF amounts are excluded from the tax bill that property owners receive each year, which itemizes how the city is spending their money. Finding that crucial hidden information is where the data nerds come in. “This stuff is enough to glaze your eyes over,” Tresser warns his audience, picking up his PowerPoint remote. He’s wrong; Tresser describes his first encounter with the TIF page on the city website, and the audience is rapt. His presentation features a city spreadsheet of individual projects with an unmanageable 4,588 rows, sortable by name, type or by amount of money allocated—but not by ward or neighborhood, the only information relevant to citizens who want to find out whether their community is being ripped off. To get at that, Tresser’s team sat around his kitchen table and worked through the spreadsheet line by line, compiling their own database—a task made harder by the fact that the TIF districts bear no logical relation to the city’s fifty wards or seventy-seven official planning areas. He flips to a slide of the city’s map of 163 TIF districts. “It looks like a lady with varicose veins!” he says. The map is even harder to work with; when you click on each district, you get a PDF document. Chicago city bureaucrats love PDFs—you can’t enter information on them into database programs unless you do it by hand, which is what Tresser’s data team did. Only then were they able to arrive at some basic conclusions about a program that ate up no less than $455 million in 2011, out of total city property tax receipts of over $1.3 billion. Another even more stunning find was that each TIF district includes a fund balance, an unspent surplus that totals $1.7 billion citywide. That’s a lot of business for whichever bank gets to hold those funds—but the identity of the bank is secret, too. Tresser begins his presentation explaining what led him to the TIF problem in the first place: hearing, over and over again, “We’re broke… sorry about your overcrowded school, sorry about your public park with no basketball hoops, sorry about the fact that you have to wait forty minutes for the bus, but we’re broke!” That is the excuse for the city’s proliferating privatization deals. It is the excuse, indeed, for Rahm’s fifty school closings. Later, Tresser describes the even more painstaking work of breaking down TIF finances in each of the city’s fifty wards; they have been able to finish only fifteen so far. (The old trouper, who is a cueball, gets a laugh joking, “I used to have hair.”) He points to a chart indicating that the Fourth Ward, which we’re in, has $15 million in its fund balance. (“The provocative question is: What would you do to improve the ward if you had $15 million in your checking account?”) He points to another chart listing the ward’s TIF beneficiaries: twenty-one private real estate developments and one public school (one of the schools, ironically, that the school board is closing), all outside the designated blighted areas. Tresser announces, “We want to deputize you to go to these projects and ask them what they did with your money.” He notes that while the city claims 54 percent of property taxes went to the Board of Education, if you include the money in the TIF “black box,” it’s actually only 36 percent. The local alderman, Will Burns, has sent his policy and communications director as his representative. At the beginning of the meeting, the aide announced that without TIFs, “high-quality development would not happen in the South Side community.” By the end, he is the recipient of some very hard stares. And a new cadre in Chicago’s activist army has been stirred. It’s not working. Such data liberations have turned into major propaganda coups for the CTU and a major driver of outrage against the school closings. So did a finding by radio station WBEZ, based on much of this same work, that of the nine empirical claims the school board was making about school closings, all nine were either inaccurate or false. Chicago is where the spreadsheets are meeting the streets—and changing the face of politics in the city. Consider the victories of the last few years. Activists helped sink an Olympic bid that would have been a giant boondoggle and land grab (the failure was a key reason Mayor Richard Daley shocked the city by deciding not to run for re-election in 2011 after six terms). The Chicago Mercantile Exchange was embarrassed into returning $15 million in TIF money. The G-8 moved its conference out of fear of an advancing activist army. The CTU led its members in a victorious teachers strike. This kind of thing is not supposed to be possible, because teachers unions are said to be despised, especially by public school parents. But not in Chicago, where in a recent poll the most militant teachers union in the country is supported by 54 percent of parents; only 9 percent side with the mayor. That mayor came into office with national ambitions, but now his disapproval rating is 40 percent, and only 24 percent of Chicagoans believe the city is better off than it was under the also-unpopular Mayor Daley. Watch Chicago. Watch it this September, when the school year is set to open with fifty fewer schools in operation. “So let me tell you what you’re gonna do,” shouted CTU president Karen Lewis in a rally last March. “On the first day of school, you show up at your real school! Don’t let these people take your schools!” The conditions are ripe for such civil disobedience: the bonds of trust within a variegated activist community; a growing culture of militancy extending all the way down to formerly quiescent middle-class parents; strategic smarts, passion, momentum. Brazil, Bulgaria, Taksim Square… Chicago. The next battle in the global war against austerity, privatization and corruption just might spark off right here.